UPDATE: This is sweet. The new Sun video player is huge (at least by web standards). 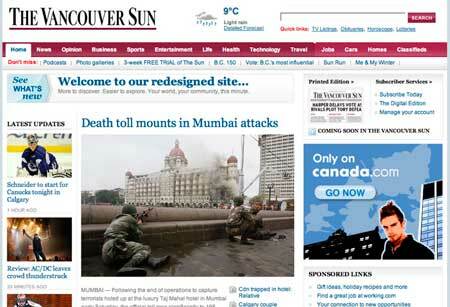 The Vancouver Sun, the local quality daily, has gone live with a remake of its web site. I haven’t had a chance to dig too deeply into yet, but it’s nicely done. The site is about 20 per cent wider, photos are bigger and there’s still lots of content on the front but it’s much better organized. For comparison, heres a screenshot of the old site, snapped just before 3 p.m. The improvement is vast. Some of the changes I’ve so far noticed: the site finally has its own URL (before it was a subdirectory of the canada.com site), the top navigation bar is two-deep and that makes finding info much quicker, multimedia is much easier to find (some of the my j-students didn’t even know the Sun does multimedia), blogs are prominently featured, extended photo coverage and videos that accompany stories are included in tabbed windows with the stories (other newspapers take note) and some articles are accompanied by sidebars with related stories from other CanWest newspapers and other media sources. There’s an awful lot of like here. I’ve criticized the Sun in the past for its online presence but the redesign (which amounts to a fairly substantial rethinking) and other recent moves (including a heavy presence by Sun staffers on Twitter) indicate they’re catching up to the online potential for newspapers quickly. This isn’t a Sun exclusive design. Strolling round the web, I notice both the Edmonton Journal and Calgary Herald, also owned by CanWest, share the same new look and I suspect the other CanWest dailies do, too. There are variations in layout at the three sites that I’ve looked at. I don’t have a problem with that. It will, long-term, be content and how the site is used that determines the value. I actually took a look at the Post site to compare and I frankly don’t see much overlap. The navigation is different, the layout is different, and the style is very much more local on the Sun, Herald, and Journal. Seems to me the local sites went to a lot of trouble to make sure they were different. I think this is much, much better than the Post. It’s what I expected — taking the National Post’s redesign and rolling it out across the other CanWest dailies, tailoring it to fit each paper’s offerings. Not a bad thing at all. 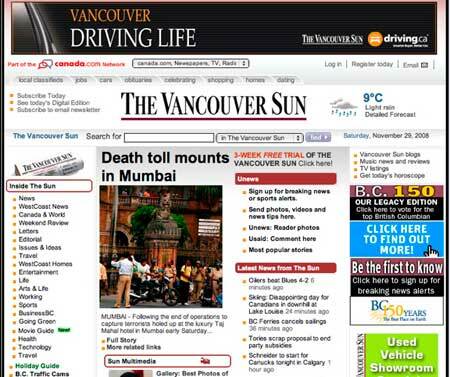 The Post’s site was a huge improvement over the old canada.com design, which was six or seven years old.